Looking for Ways to Be Green? How About an Eco-Friendly Makeover on Your Cup? These days I don't do many reviews but the GreenPaxx company caught my eye with their Cool Cap and Cool Straw. Made from 100% food grade silicone, you have none of the worries over BPA and toxic chemicals you have with plastic and they also are tough as nails and last for years so you won't be tossing them onto the landfill. When it is finally time to recycle them, you can simply take them at your local recycler though they cannot just be tossed into your county recycling bin. The really awesome thing about the eco-friendly Cool Cap that I love, is that it is a universal cap that fits like every flipping cup I have tried it on and nothing spills when it falls over. 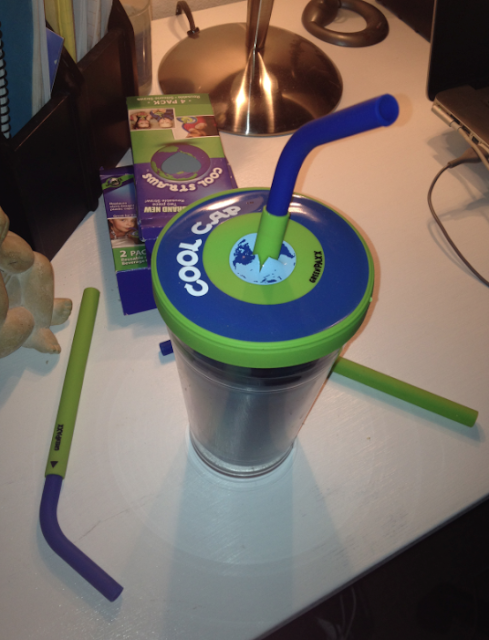 The Cool Straw is also nice and wide which is perfect for thick and healthy veggie and fruit smoothies.